Roberta Raine taught translation (Chinese-English) in the Department of Translation of Lingnan University (http://www.ln.edu.hk/tran/), Hong Kong, from 2007-2016. She was one of the very few Translation Studies scholars to do research into the history of Buddhist translation in Tibet, and made this her main area of research from 2009-16. She has published numerous articles on this and other Tibet-related topics (see publications, below). 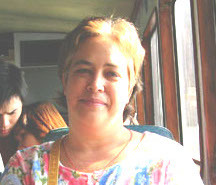 Roberta received her PhD in Translation Studies in 1999 from the City University of Hong Kong. After completing her PhD, she worked for eight years as a Chinese-English translator for human rights organizations in the US and Hong Kong, including The Dui Hua Foundation and Human Rights in China (HRIC). She is an American but spent half her life in Asia, living and working in Hong Kong, Taiwan and mainland China. Though Chinese is her second language, she has also studied the Tibetan language and has been a practicing Buddhist in the Tibetan tradition for some 20 years. “The Buddhist Translation Histories of Ancient China (c. 150–1276) and Tibet (c. 617–1750): A Comparative Study.” Asia Pacific Translation and Intercultural Studies 3.1 (2016): 2-21.